Greg Myerson of Westport, CT with the world record 81.8 pound striped bass he caught this summer. 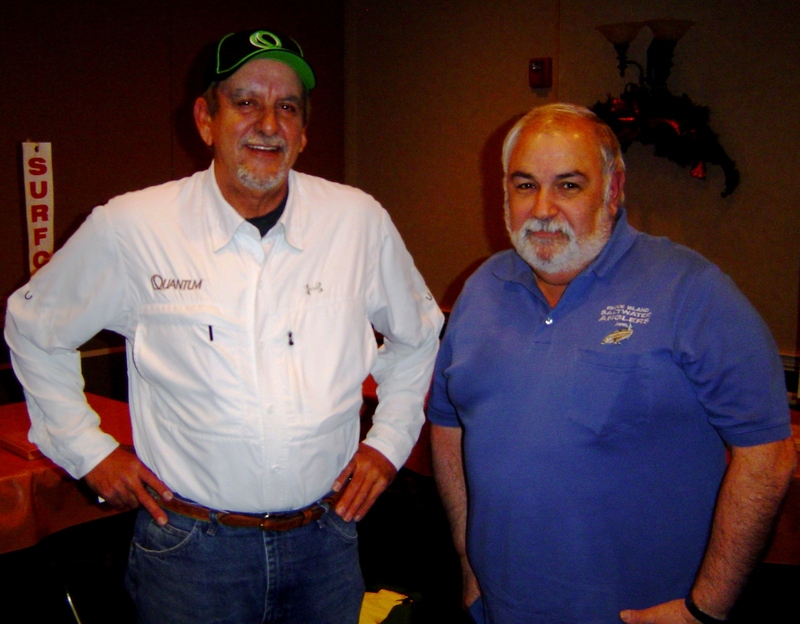 Greg was a speaker at the Saltwater Sportsman National Seminar Series held this past Saturday at Mohegan Sun. 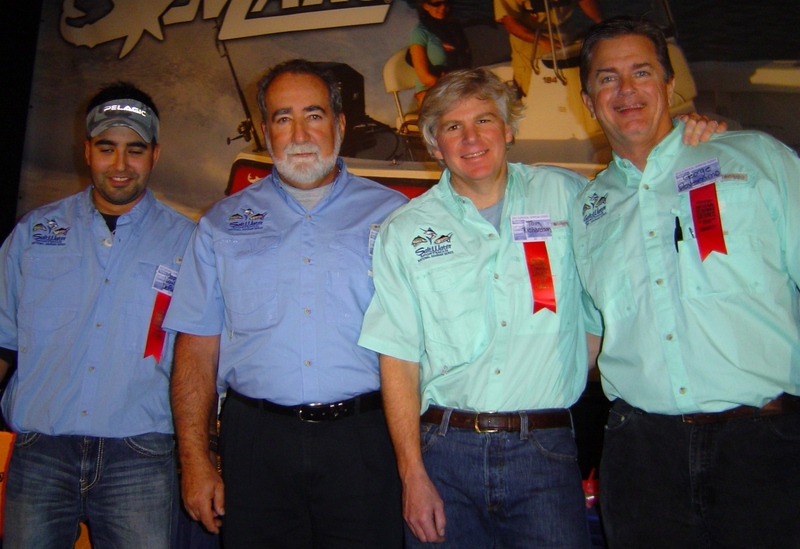 (Left to right) Rhode Island Captains Louis DeFusco and John Rainone shared the stage with Saltwater Sportsman National Seminar Series co-host Tom Richardson and host George Poveromo. 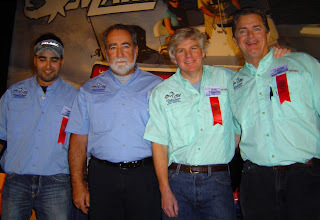 George is host of the George Poveromo’s World of Saltwater Fishing television program. The 25th Anniversary Tour of Saltwater Sportsman magazine’s national seminar series got off to a great start Saturday at Mohegan Sun in Uncasville, CT with approximately 900 anglers in attendance. This was the first seminar in a series of eight that will travel the east coast. The series is hosted by George Poveromo of George Poveromo’s World of Saltwater Fishing television program and editor-at-large for Salt Water Sportsman magazine, and Tom Richardson, noted authority on fishing the coastal waters of New England and a prominent fishing writer and editor. George and Tom shared the stage with eight local captains, two of them from Rhode Island. Captain John Rainone, past president of the Rhode Island Party & Charter Boat Association and a distinguished Point Judith, Rhode Island based charter captain from the vessel “L’il Toot”. The second Rhode Islander sharing the docket was Captain Louis DeFusco of West Warwick, RI who runs the charter vessel Hot Reels out of Point Judith (Captain DeFusco captured the Rhode Island swordfish record this summer with a 434 pound fish). Greg said that he has invented a new fishing tackle device that attaches to your rig that is designed to mimic the sound of a lobster. He will show the device at the Springfield Sportsmen’s Show in February this year (visit Greg’s website at www.worldrecordstriper.com). Each captain and fishing expert shared their favorite way to catch a variety of species. 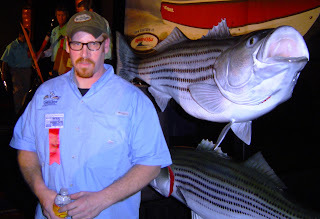 When asked about his favorite way to catch striped bass seminar host George Poveromo said, “I like top water lures. There is nothing like when a bass hits the plug.” (visit www.noflukefishing.blogspot.com for a video interview). Here are some highlights of what other fishing experts had to say about tuna and striped bass fishing (fluke and tautog tips to follow in future columns). When fishing for tuna, watch the water for birds feeding, oil slicks from past blitzes on bait in the area, whales feeding, etc. The answer to the question “where are the fish” is usually right in front of you. You have to learn how to read the water to find them. When on the troll floral carbon leaders “give you strength plus a thinner, less visible presentation.” said seminar host George Poveromo. Favorite ways to catch bass as related by experts included fishing with a three way swivel with eels (this method is world record holder Greg Myerson’s favorite method); top water plugs and swimming lures; a variety of soft plastic baits; and fishing with menhaden chucks or whole live fish. Summer fishing for big bass is usually done at night, water typically 70 degrees, fish structure (reefs) in 28 to 44 feet of water starting at the high point of the reef; Captain Rick Mola of Norwalk, CT said, “One of the tactics we use in the summer is fishing with parachute jigs. I troll at 2.5 to 3 knots and tell customers to envision they are sweeping the floor.” rather than using hard jerking motions. Captain Mola also said, “We use menhaden often in the spring, either live or in chuck form, generally in low water.” (visit www.noflukefishing.blogspot.com for a video interview with Captain Mola on fishing with menhaden). The Rhode Island Marine Fisheries Council, their advisory panels and a major public hearing will be convening this month and next to determine what fishing regulations will be recommended for 2012. Anglers are urged to attend these meetings as this is the opportunity we have to impact fishing policy and regulation here in Rhode Island. The meeting schedule form the Department of Environmental Management Marine Fisheries website is as follows: http://www.dem.ri.gov/topics/mftopics.htm for details, meeting times and locations. Greg Myerson of North Branford, CT weighed in an 81.8 pound striped bass at a Westbrook, CT tackle shop this summer. The striped bass captured the world record that was previously held by Al McReynolds who caught a 78.8 pound bass in 1982. I spoke with Greg about catching his record fish which will be covered in a post later this week. But, here is a brief video on what he had to say about catching big bass (interview took place Saturday, January 7, 2012). Captain Jim White (left) presented on “Striped bass decline” at last week’s Rhode Island Saltwater Anglers Association monthly meeting. Steve Medeiros, president of the Association, pictured with Captain White. Last week Captain Jim White, a noted author and charter captain (www.whiteghostcharters.com), said, “Researches have said as much as 75% of the striped bass (in the Chesapeake Bay) are infected by mycobacteriosis and they are dying from the disease. “ Captain White presented this and other information about striper decline at the Rhode Island Saltwater Anglers Association monthly seminar meeting held last week at the West Valley Inn, West Warwick, RI. Captain White said that at their December meeting the Atlantic States Marine Fisheries Commission (ASMFC), which regulates fishing regionally, decided not to reduce striped bass commercial and recreational quotas. “This was a mistake.”, said Captain White. “They had Addendum III on the table but declined to do anything.” Addendum III suggested a reduction in the commercial and recreational striped bass harvest for 2012. At their meeting ASMFC members deciding not to change striped bass harvest amounts pointed to results from a 2011 survey conducted by researchers at the Virginia Institute of Marine Science (VIMS) that suggested the production of a strong class of young-of-year striped bass in the Virginia portion of Chesapeake Bay. The 2011 year class represents the group of fish hatched this spring. The news was positive and seemed to have influenced fish managers at the meeting. This class of striped bass is expected to grow to fishable size in three to four years, the bass migrate north in the spring to as far as Maine and then migrate back to the Chesapeake Bay area in the fall. The 2011 study recorded more than 27 fish per seine haul, significantly higher than the historic average of 7.5 fish per seine haul. This is a significant increase from recent years, during which catches of young fish were average. Follow link for study release: http://www.vims.edu/newsandevents/topstories/striped_bass_survey_results.php.